"This second book was definitely better written than the first, so I am really looking forward to book #3 which is supposed to be coming in June." Pieces of Light by Julie Cave did, in fact, come out in June, and when the opportunity to review it came up, I definitely wanted in. I received the book last week, and I carefully put it away for this weekend -- as a reward for accomplishing some things I've been procrastinating on. I picked it up yesterday, and it was like catching up with an old friend. I couldn't set it down until I was finished. 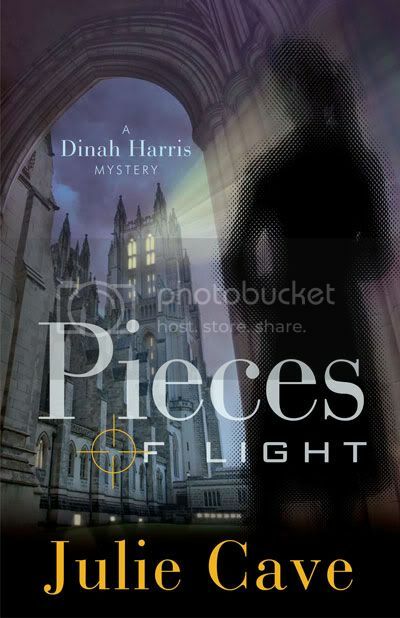 Detective Dinah Harris hunts down a serial bomber targeting religious icons and buildings. The bomber is on a mission to rid the city of religion and establish a 'new world order'. Can someone so intent on ridding the world of God experience redemption? What lies behind his hatred of God? Will his darkened soul search for pieces of light? struggles. It is interesting, though, to see just how far she has come from the mess she was in the first book. Her life really is turning around. This book is written in a slightly different style than the previous books. We are apparently reading a journal of the serial bomber in the present time, interspersed with one year ago, where Dinah is on his trail. That back and forth took a little getting used to, but it was effective. The main plot, of course, involves Dinah being called in by the FBI to work on what turns into a serial church bombing case. There are side stories too, including a romantic angle that I don't think I would have enjoyed quite so much if I wasn't already familiar with Dinah. Senator David Winters is present in a side storyline as well, just as slimy as ever. Another side story involves a good church-going family that has been hiding decades of physical abuse by dad (who died right before the story opens). Oh, wow, was this storyline powerful. A lot of that had to do with people choosing not to see abuse -- and about the cycle and what happens to the victims. As in the previous books, the one complaint I have is that parts tend to get a lot more preachy than I prefer. Separation of church and state was a big topic in this book, as was the idea of being unequally yoked. I don't disagree with the points being made, and some of the material seemed totally appropriate, not that I can cite examples without major spoilers. I just wish the "message" was woven into the action a bit more instead of being presented more like a series of lectures. That being said, I truly enjoyed this story, and my hope is that this isn't the last we hear from Dinah Harris. I want to know what happens next. Thanks for hosting Edna! Following you on the Crew!